A waffle maker isn’t just any other 2 iron plates coming together to bake batter. There are several factors that you should consider. An ideal waffle maker should make deep-pocketed waffles that’ll hold any toppings confidently and without messes. It should also be easy to remove the waffles from the plates. As such, they should be non-sticky and should heat well. Waffle makers that allow you to control the shades are more favorable since you get what you want. Moreover, those that not only bake waffles but have extra plates for grilling and frying are always irresistible. These are our best picks of this year’s best-rated waffle makers. 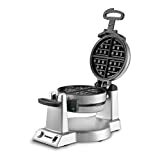 If your children can’t get out of the bed on a weekend without the smell of some browning waffles, you’ll need to get this Hamilton Waffle Maker (26009). This Belgian-style waffle maker has a non-stick interior design, so you get your yummy waffles hustle free. Unlike most other competitors made of cheap plastic, Hamilton 26009 features a sturdy stainless steel construction. It’s easy to use. Its preheat lights will always alert you when it’s time to pour your batter. Hamilton Beach 26009 comes in a compact size and a thoughtful design make it super easy to store when it’s not in use. How would you love thick, crunchy, and deep-pocketed waffles anytime you want them? Besides offering you the super crisp waffles, T-Fal SW6100 EZ has more for you. It comes with an extra plate for those who love sandwiches too. These 2 plates are easily interchangeable and go safely in the dishwasher. You never have to worry about storing your waffle maker. It stands vertically either on your kitchen shelves or drawers. This Hamilton Beach Flip Belgian Waffle Maker has a lot of incredible features to give you the fluffiest waffles just as you like them. From its easy to use control, you’ll be able to brown your waffles to your desired state, a feature we’ve not seen in the past 2 makers. Moreover, Hamilton Beach takes care of any drips thanks to is drip tray. This means that you’ll have little to no mess to worry about. Its metal grids come out easily for cleaning and its handle collapses for stress-free storage. When shopping for a waffle maker, a primary concern is the thickness of the waffle made. People also tend to care so much about how deep the pockets are. Oster CKSTWF2000 has all those issues covered. Its stainless steel grids will make you a 7 1/2’’ waffle in a couple of minutes. Its pockets are thick enough to hold your syrup or fruit. How do you like your waffles? A little crispier and brown on the outside? You can control all that at the turn of a knob. 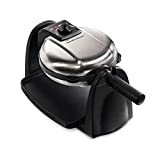 ‘’What else can it cook?’’ This is amongst the leading questions when most people are looking for an ideal waffle maker. It’s good to have a product that gives you real value for your bucks. 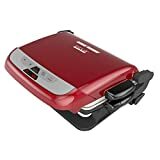 If you’re a waffle diehard fan or a grill monster, this George Foreman GRP4842R needs your attention. 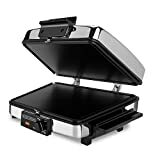 It’s a 3-in-1 beast that’ll make your waffles in the morning, press some Panini, and later grill you some meat and vegetable. Its adjustable hinge allows it to accommodate thin to thick foods. Besides, it also offers a healthier and responsible way to enjoy your everyday delicacies since it’s able to draw 42% of food fats and direct it to its drip tray. No one would fail to recognize the presence of this eye-catching waffle maker as it sits on your kitchen top. It’s made of stainless steel which adds to its durability. With its browning control knob, you can easily select the shade of your waffles from either light to brown and crispy. There’s no way you’re going to burn your waffles. Its LED lights will alert you once it’s time to feast on your hot waffles. Buyers loved its deep pockets, its double cooking action, and the way the waffles lift up from the non-sticky grids. This is a must-have for your waffle loving family. It’s a double maker that’s more similar to Cuisinart WAF-F20. Amongst its top notch features is the ability to rotate the waffle to ensure that you get evenly cooked waffles. Also, you get customized waffles courtesy of its easy-to-use browning selector. You’ll also love the deep pockets which hold your whipped cream or berries comfortably and mess-free. Its led lights and a beeper that inform you once your waffles are ready come as another plus to Waring WMK600. What does this 3-in-1 maker have to offer? Total versatility and best bang for your buck. The key feature that makes Black + Decker irresistible is its foldable top that lays flat to give you two flat surfaces to prepare your omelets and bacon all at the same time. 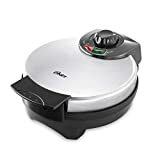 This multi-purpose champ heats from both ends and has controllable heat levels allowing you to fry, grill, or make some waffles or sandwich. Its non-sticky plates make it super easy to lift all your foods after they’re done cooking. A funnel at one edge the of the bottom plate lets you drain off excess fat. 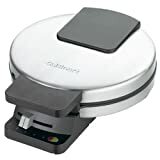 From Cuisinart, this is another waffle maker that can be counted on for its traditional waffles. 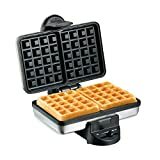 Its weighted top makes sure that it doesn’t lift as the waffle rises. This helps in creating deep pockets ideal for holding fruit syrup, powders, nuts, or any other toppings you desire. With its 5-setting shading control, you’ll be able to make precise round waffles browned just as you love them. 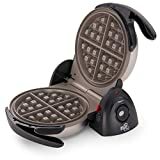 Moreover, this Classic Waffle Maker comes with rubber feet to prevent scratching or making some marks on your kitchen top. You also benefit from a waffle recipe book full of exciting recipes. This Presto 03510 Waffle Maker is today’s best seller. Baking at 1350 watts, this waffle maker has way hotter grids than other models. You’re bound to love its fairly deep pockets that hold the batter nicely and its tapered grids that help in releasing the waffle. The grid plates are coated, so your waffles don’t stick making it very easy to clean. In fact, there’s almost nothing to clean. Presto 03510 have an upright storage lock that holds the 2 plates together for compact storage. The grid plates are coated, so your waffles don’t stick making it very easy to clean. In fact, there’s almost nothing to clean. Presto 03510 have an upright storage lock that holds the 2 plates together for compact storage. If you’re searching for a versatile waffle maker, George Foreman, T-fal and Black + Decker are the way to go. Presto 03510 and Waring WMK600 are the best in delivering evenly cooked and browned waffles. Apart from Presto, all other makers allow you to control how brown you’d want your waffles. However, you can still get the same results with Presto just by giving it enough time to bake. Apart from Presto, all other makers allow you to control how brown you’d want your waffles. However, you can still get the same results with Presto just by giving it enough time to bake.